This is major. Mayor Pete Buttigieg just surpassed the donor goal needed to qualify for participation in the first Democratic primary debate in June. The Democratic National Committee requires that a candidate receive a minimum of 65,000 individual donors before being invited to the debate stage. Well, this past weekend, the 37-year-old mayor of South Bend, Indiana met the criteria and then some. 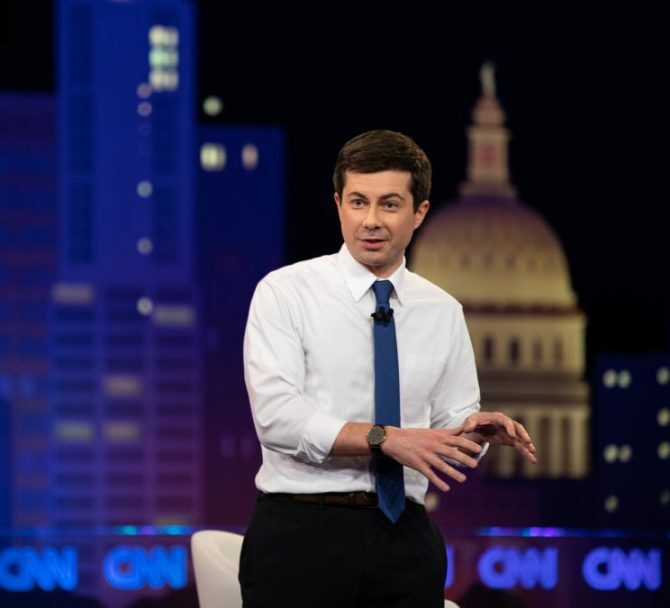 This means that, for the first time in history, an out gay man will participate on stage in a Democratic presidential debate. Following CNN’s Town Hall, Buttigieg had the largest fundraising day of his potential 2020 campaign, raking in over $600,000 in just 24 hours. Note: As some have mentioned, Fred Karger ran for President in 2012 as a Republican, but did not appear in any debates. Buttigieg will be the first in either parties debates. It is pretty major. Thanks for posting. Now I need to take him more seriously. This guy is the smartest person running in my opinion. He speaks 8 languages, went to Harvard, is a Rhodes Scholar and a veteran of the War in Afghanistan. Unfortunately even with all his credentials, he will not get close to the nomination. Nor will he be president. There’s just not enough gay people to vote him in. I think it’s great to see an openly gay candidate, 8 languages & going to a great school plus serving our country (TY) will not get him close, unfortunately, he’s unknown. Wait a minute; he’s not the first gay man to run for President. Didn’t Lindsey Graham run for a short time during the Republican Primary that ended up selecting Trump? Pretty sure he was on the stage when they had all those Republicans trying to debate. He’s the first out of the closet gay Democrat to run for the Presidency. Fred Karger was the first out Republican, I think. There’s a huge difference between Buttigieg and Karger, and that coward Lindsey Graham. Ewww. We don’t claim him and thank god he doesn’t claim us. Everyone needs to listen to this guy. He’s a breath of fresh air. Is it really necessary to say “out gay” EVERY TIME? It’s not part of his name & it’s not part of his current job as Mayor. His orientation is NO MORE RELEVANT to his run for President as Kamala Harris’ or Beto O’Rourke’s who happen to be “openly straight.” _Let’s back off. He’s simply the best candidate for the job! Except I’m also tired of the old media B.S. of trying to downplay who somebody is. Clay Aiken tried that crap when he ran for office and it backfired. He is the mayor of South Bend and considering has has remained completely mute concerning the sexual assault and cover-up allegations directed against Notre Dame, and also considering the fact that he has never endorsed the “me too” movement, means that he is going to fail big with women voters. Frankly as a gay man I am more than a little suspicious of another gay man that refuses to condemn sexual assault.